These moist and flavorful muffins were a bestseller at my bakery. This is my favorite time of the year, and not just because all the cabbage worms and blister beetles have been killed by a nice hard frost. No, it's more than that. The pleasant crunch of leaves underfoot, the smell of woodsmoke in the air, the invigorating cool weather can only mean one thing—The Season Of Eating has begun. Fall is in full bloom out here in the country, and I am ready to eat. There's nothing like a crisp autumn day spent turning the compost piles or cleaning up the kitchen garden to stimulate the appetite. So what if the last few heads of lettuce froze during the night? The days of green salad and sorbet suppers are over. It's time to pack away the tank tops, slip into those heavy sweaters, and delve into six months of serious eating. Favorite novels are forsaken as I fall asleep at night reading of crusty breads, slow roasted dinners, and the best way to make sausage gravy. This is also the season when forgotten friends and relatives suddenly appear on your doorstep, wanting to be fed. Of course what these ravenous visitors are truly hoping to find—as they cross over your threshold with their noses expectantly sniffing the air—is the heady aroma of homemade baked goods wafting out of the kitchen. Since a disappointed and malnourished guest is a terrifying sight, it's always a good idea to have some little yummy thing on hand, like these moist, and filling muffins. They're easy to make and taste delicious any time of day. Since they're not overly sweet, you can even serve them as an addition to bread or rolls at your holiday dinner. This recipe makes about 18 good-sized muffins, so you'll have plenty on hand for everyone wanders into the kitchen in search of snacks. If you're expecting heavy hungry traffic, consider making two batches and sticking one in the freezer. Simply defrost later at room temperature, toss a little cinnamon into the air, and claim they just finished cooling. 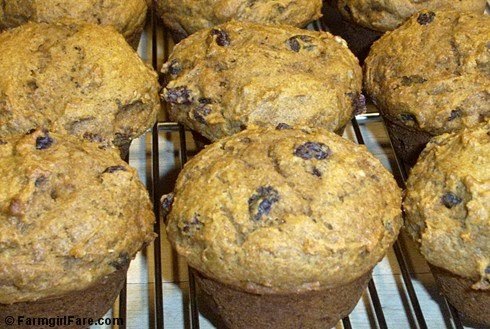 You can make these muffins using all white flour, but the 1/2 cup of whole wheat flour adds more depth to the flavor and texture. Soaking the raisins in the orange juice makes them nice and plump, but is not absolutely necessary. I usually use pecans, but I made this batch with walnuts, and there were no complaints. If you want to go the extra mile, you can spread the nuts on a baking sheet and toast them at 350° for about 10 minutes. As always, I urge you to seek out local and organic ingredients; they really do make a difference. Organic raisins are an organic best buy, and organic canned pumpkin is easy to find. Even organic sugar is becoming mainstream. I stock up on organic butter when it goes on sale (often for $2.50 a pound) and freeze it. Now that I live several miles from anyone (and several states from any relatives), unexpected guests on the doorstep are rare. But I did hand a steaming bag of these muffins to some grateful deer hunting friends passing through the other day. You can also make lots of bite-size baby muffins. Heat oven to 350°. Place raisins and orange juice in a small bowl and microwave for 2 minutes; set aside. Grease muffin tins (I love my Chicago Metallic commercial muffin pans). © FarmgirlFare.com, the sugar and spiced foodie farm blog where Farmgirl Susan shares stories & photos of her crazy country life on 240 remote acres—and nobody leaves the farm empty handed. Okay, how is it that a) every time I come over here I am immediately STARVING simply because of whatever you have posted and b) there are about 12 million new posts to my one or two...I am appropriately awed! The new banner is fantastic - wow. And I love the photos of the cats! Wellington would love it at your place (although he finds enough to get into here!). One thing I like about the passing of summer is that you seem to be posting more recipes. That works for me. I will have to try these. The beer bread recipe was fantastic! Thanks for the recipe. I thought you didn't like pecans! Or maybe you're making an exception for these delicious muffins? I love love LOVE pumpkin, and although the cool weather is invigorating, at the same time I really miss going out the door in a sundress and sandals. Even just moving back to the north part of the state is a shock--south Florida spoiled me! I just baked these muffins and they are a hit. Thnaks so much! Will definately make again. The muffins look more than great, so I'll try to make them myself. Just one thing, over here in the Netherlands there is no canned pumpkin whatsoever available. Do you use a plain of a more sweet variety? I'll have to do experimenting with fresh made mashed pumpkin. I apologize for not getting back to you sooner. I don't do much cooking with fresh pumpkin, and I've never used it to make these muffins. That said, I'm sure they would taste fantastic using fresh pumpkin. Most people feel that the best kind for baking are the smaller "sugar" pumpkins, as opposed to the larger ones that are sold at Halloween for Jack-O-Lanterns. If you or anybody else makes these muffins with fresh pumpkin, I'd love to hear about it. Thanks! I just made these at the weekend using fresh pumpkin, but my goodness me tackling the pumkin was work! I have a muffin-related injury - a big blister on my finger from hanging on to the knife while I peeled and chunked! I sweetened the pumkin while it was cooking with just a little golden sugar, and I also simmered in 6 cloves as I didn't have any ground cloves. The muffins worked beautifully, although I think English muffin tins are a bit mean-sized, as I made 26 out of this recipe. The muffins came out moist, and a fantastic deep orange colour. Partner, who hates pumpkin, ate about 6 of them. I made these muffins this weekend and they were oh-so-yummy! I had to substitute cranberries for raisins due to my dd's preferences and I didn't have pecans but they were fabulous all the same! I made 24 really high, flavourful and gorgeous looking golden muffins. This recipe is going into my permananet collection - yummy! I can't wait to try these muffins. They sound great. Just a note for those using fresh pumpkin, it is MUCH easier to cut the pumpkin in half, clean out the seeds, put it cut side down on a baking sheet and bake it at a low temp for an hour or so. Then when it cools you can just scoop out the pulp and process it. Saves a lot of peeling and chopping. I bake up this recipe today and they were absolutely delicious! Perfect for a rainy November afternoon. Used walnuts instead of pecans (cheaper) and a mix of raisins and dried cranberries. Thank you for sharing this recipe. I made this twice because the first time didn't go well. It was too cakey. I over mixed the butter mixture. The second came out perfect. Added orange zest, lessen the sugar and used 1/2 c. butter. Do you mind if I post this in my site? Thanks again and hope to hear from you soon. So glad you enjoyed these muffins! I'm always flattered when someone wants to share my recipe (or their version of my recipe) on their own blog. All I ask is that you please credit me with the original recipe and include a link back to this post in your post. Thanks so much. Love, love, love these! And so has everyone I've fed them too including a lucky two dozen at Girl Scout Camp. Hello! I just found out that I am diabetic and I made your bran muffins as a way to get some bread back into my diet. They are delicious and very, very moist. And wonderfully, they do not seem to effect my blood sugar (although it is a struggle not to eat the whole batch) Well, since I seem to be in a food rut and my husband tells me that I cannot live on blueberry-banana bran muffins, I would like to try this recipe, but I don't think the white flour is a good idea. Do you think it will work if I just go ahead and use 3 1/2 cups of whole wheat flour? or 3 cups of whole wheat flour and 1/2 cup bran? Thanks a bunch for all you do! I'm so glad you like the bran muffins. As far as making this recipe with 100% whole wheat flour, I think it would work, but you might want to try using white whole wheat flour. It's still 100% whole grain, but it's made from a different type of wheat and bakes up 'lighter' than regular whole wheat flour. You could also use some whole wheat pastry flour, but probably not the entire 3-1/2 cups. I definitely think 1/2 cup of bran (wheat or oat) tossed in would be a tasty, healthful addition. I just wanted to say I've never made muffins from scratch before and I came across your blog and had to try the blueberry bran and the pumpkin spice ones right away...and I did! I made both, one right after the other... I just had a taste and they were so delicious! thank you for the easy to follow instructions!! For a newbie like me, it couldn't have been more straight forward. Thanks! I'm gonna bookmark your page and make sure I come back for more recipes! Hi! I am so glad to found your blog! My husband and I have a Farm and a Bakery in Afton, VA. I am not a trained baker but we have been very successful baking artisan breads. Now we would like to start with some pastries, and muffins are our first choice. Could you give us some advice about double, triple... your recipe? I wish we lived closer. I am able to buy pecans in northern GA for a very reasonable price. The man has a pecan farm in So. GA and brings the pecans up every holiday season. His mama shells them. $8 for two pound bags. These muffins were a big hit for Thanksgiving morning (since I opted not to make a pumpkin pie). 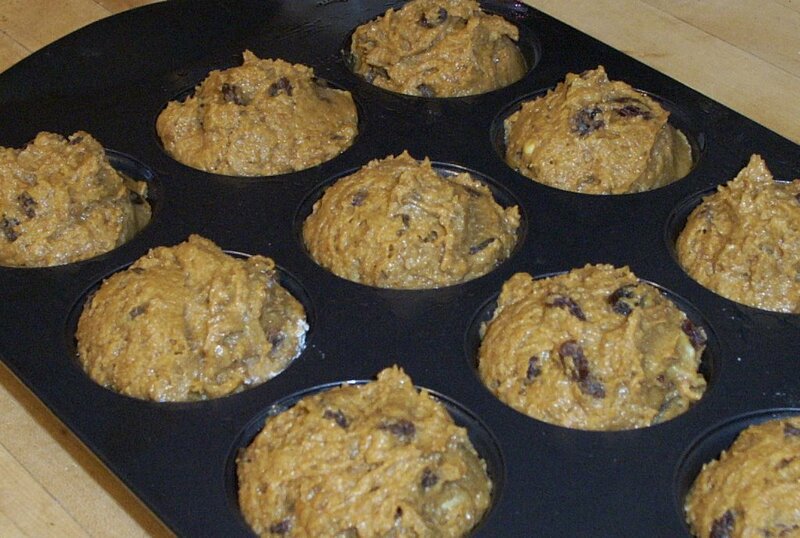 I substituted the raisins with cranberry/craisins and we loved them. We will definitely have these again. I discovered your blog today, while searching for a recipe for pumpkin muffins. Sure glad I did, too! I've subscribed to its feed so I can read it on my Kindle when I'm away from home. I love it already! Am going to make these in the mini-muffin version today. Thanks. They sound delicious. I was searching for a use for the can of pumpkin I had in the fridge and this just fit the bill. The muffins went over wonderfully with my 10 month old daughter loving them the most. Whenever she saw someone grab one to eat she would toddle on over making 'feed me' sounds and open her mouth for a bite. Thank you for the recipe! Hi Farmgirl, it's jennybee... do you have a pumpkin muffin recipe with a cream cheese type of filling? kind of like the one they serve at starbucks this time of year? I'll check back at these comments to see if you answer. Thx! Thanks farmgirl for your response... of course I hope you do create a pumpkin cream cheese recipe :) in the future! I wanted to post to say that I just found this recipe and intend to make it! And for anyone in the UK, you can get canned pumpkin at Waitrose now, at least in the London ones, so I guess the Ocado delivery service would do it as well. For the person looking for a Starbucks type of pumpkin muffin, I found a recipe on the Kitchen Parade website recently. I subscribe to it and have made quite a few things, all good! Hello! These muffins were great! If I want them a little more pumpkiny and add more pumpkin what other ingredients do I need to alter? I'm so glad you enjoyed the recipe. Upping the pumpkin factor is a great idea. If you used 1 cup (2 sticks) of butter, I would reduce it to 1/2 cup and use an extra 1/2 cup to 1 cup of pumpkin. If you are already only using 1/2 cup of butter, I would simply add another 1/2 cup to 1 cup more of pumpkin. 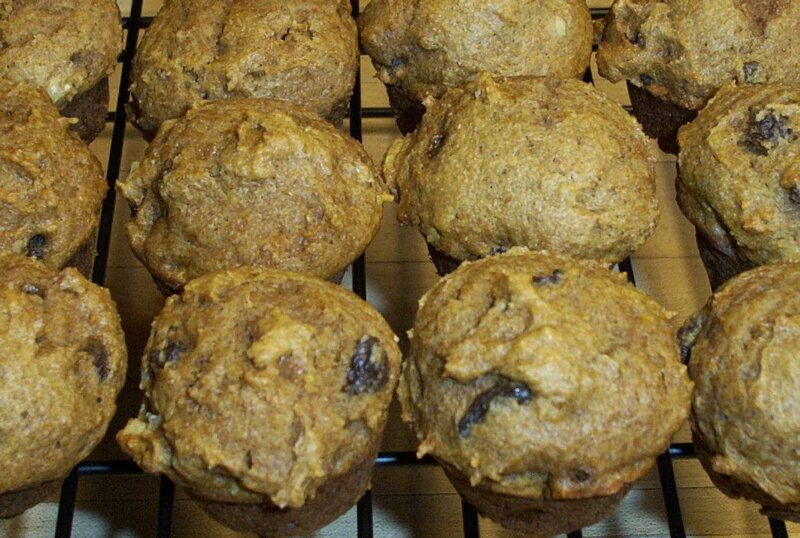 Bear in mind that pumpkin puree isn't sweet, so the muffins may end up a little less sweet than the originals.